Non melanoma skin cancer includes basal cell skin cancer, squamous cell skin cancers and other rare types. Melanoma skin cancer is different to non melanoma skin cancer. 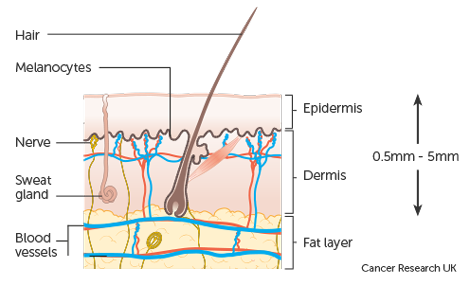 The skin is made up of 2 main layers: the epidermis on the outside and the dermis beneath. The thickness of the epidermis and the dermis varies depending on the part of the body the skin is covering. For example, the skin on the soles of your feet is quite thick, with an epidermis and dermis of about 5mm. The skin on your eyelids is much thinner, about 0.5mm. Sun damage is the cause of most skin cancers. The cells in the epidermis are most at risk of sun damage. The most common type of cells found in the epidermis are called keratinocytes. Basal cells are a special type of keratinocyte found at the bottom of the epidermis. 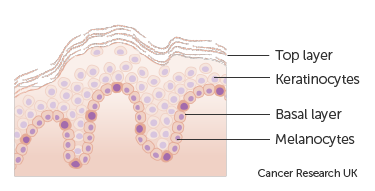 The basal layer is where all normal skin cells come from, and where basal cancer cells (BCC) develop. BCC is the most common type of skin cancer. The top layers of the skin are made up of cells that have died and become filled with keratin. Keratin is made by the keratinocytes, a tough waxy substance that helps to make the skin strong to protect the body. Squamous cancer cells (SCC) also develops from keratinocytes in the epidermis. There are cells in the deeper layers of the epidermis called melanocytes. Melanocytes make melanin. This is the brown substance that the melanocytes produce when the skin is exposed to the sun. It's these cells that can become cancerous in melanoma. There are several different types of non melanoma skin cancer. The most common are basal cell skin cancer (BCC) and squamous cell skin cancers (SCC). These cancers develop from cells found in the epidermis. Skin cancers can grow slowly and it can take some years before a cancer is noticed. But sometimes a skin cancer can grow very quickly, within a few months. The older you are, the more likely you are to get a non melanoma skin cancer. In 2015, around 142,100 cases of non melanoma skin cancer were diagnosed in the UK. The number could be higher as we know that they are under reported. This makes it the most common type of cancer by far. Because non melanoma skin cancers are easy to treat and cure, they're often left out of national cancer statistics.